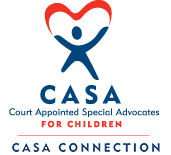 CASA Connection belongs to a network of over 900 community-based programs that recruit, train and support citizen-volunteers to advocate for the best interests of abused and neglected children in courtrooms and communities. CASA Connection covers abuse and neglect cases in Platte and Colfax Counties. However, we have volunteers from surrounding counties volunteer for our program, because there is not a CASA program in their county.